Image Credit & Copyright: NASA/ESA Hubble Space Telescope, GALEX Space Telescope & Spitzer Space Telescope. CLICK image for larger view and look below for information and related links. 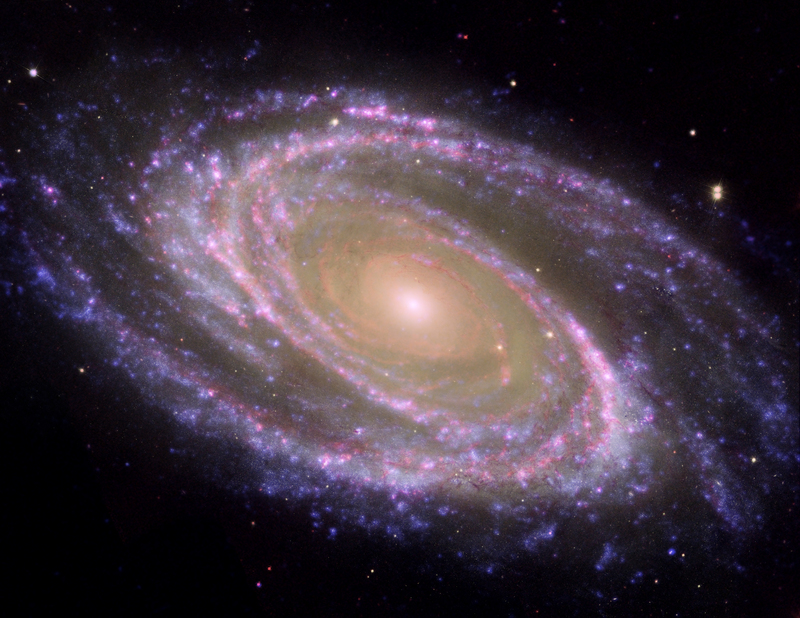 This image of the brilliant spiral galaxy M81 comes from a collaboration between the NASA/ESA Hubble Space Telescope, GALEX Space Telescope and the Spitzer Space Telescope. M81 was discovered by Johann Elert Bode in 1779 and because of this it’s often referred to as Bode’s Galaxy. If you look to the night sky with binoculars and you focus your well-adjusted night eyes to the constellation of Ursa Major or the famous asterism of the Big Dipper, you will want to look slightly up and right of the pointer star Dubhe at the end of the dipper itself. There you may see this faint magnitude 6.9 smudge of a hundred billion stars; well, the nucleus at least. That smudge, or star city resides 11.6 million light years away and the galaxy itself spans roughly 64,000 light years in diameter. Anyone calling that galaxy home, may be looking out at our massive Milky Way and from their vantage point, if they could see us at all, would see earth as it looked 11.6 million years ago. Many of those stars that we’re viewing no longer exist at all. In fact; the entire galaxy is likely not even in that location on the sky anymore as everything in the universe is in constant motion. While we have M81 in our sights, let’s have a quick look around. One of the first things that strikes me about this image besides the stunning false color look it’s been given which represents the combined data of the three legendary telescope is that it has two distinct arms. Those arms stretch almost completely around the nucleus and they’re teeming with new star formation. How about that core? Well, it’s clearly different in appearance from the rest of the galaxy……so why is that? Ever make a whirl pool in your pool at home for fun or cleaning, what happens? That’s right, any debris in and on top of the water congregates at the center. That same process (for the most part) is happening here. As M81 rotates, the stars that have been around longest have lived long enough to make the trip to the center of this proverbial pool. Nuclei of spiral galaxies, as well as the globular clusters “above” and “below” the galactic plane contain some of the oldest stars in the galaxy. Over time, the possibility arises for the unlucky few (or lucky depending on whom you ask) to meet their demise in the mouth of the infamous 70 million solar mass, supermassive black hole at its core. Name: Bode’s Galaxy, Messier 81, M81, NGC 3031. How far is it? : 11.6 million light years. How big is it? : About 120 light years in diameter and 0.5 degrees of night sky (about the size of the Full Moon on the sky). Apparent Magnitide? 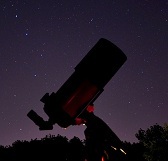 : 6.9 which is out of naked eye range but small telescopes in dark locations should pick it up easily. Discovery: Johann Elert Bode on December 31, 1774. Where is it? (General): Constellation Ursa Major (Big Dipper asterism region). Image | This entry was posted in Astronomy (Learning), Astrophotography (DSOs), Galaxies, Images and tagged Bodes Galaxy, DanSpace77, ESA, GALEX, Hubble, Hubble Space Telescope, M81, Messier 81, NASA, NGC 3031, Spitzer Space Telescope. Bookmark the permalink.